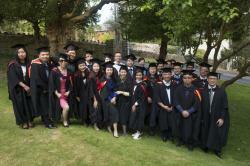 The 34 visiting graduates and their guests enjoyed the traditional graduation ceremony in Bangor University. They will also enjoy a week long programme arranged by the Bangor International Education Centre to visit various local attractions including Bangor’s Two Dragons Chinese Garden, a project supported by the Bangor Confucius Institute and the British Council. “We had great professors while studying in China over the last two years, and covered advanced activities, projects, presentations and discussions. “I came to balance work and study, and what I’ve learnt will help me a lot in my daily work and in my career,” she added.